The Massachusetts State chapter of National Association of Directors of Nursing Administrators/ LTC (NADONA), The New England chapters of Gerontological Advanced Practice Nurse Association (NE-GAPNA) & The Connecticut Medical Directors Association, are very pleased to announce that Dr. Alice Bonner will deliver the Key Note at the First LTC Multi-Disciplinary Conference at the Foxwood Resort and Conference center Mashantucket, CT on October 21, 2016 at 7.30PM. Dr. Alice Bonner is Secretary of the Executive Office of Elder Affairs for the Commonwealth of Massachusetts. At Northeastern University in Boston, she serves as Associate Professor of the School of Nursing and Faculty Associate at the Center for Health Policy at Bouve College of the Health Sciences. She also serves as Program Director of the Schwartz-Jonas Fellowship for Compassionate Care. Widely recognized nationally as a progressive leader in health policy, Dr. Bonner co-led the Centers for Medicare & Medicaid Services (CMS) National Partnership to Improve Dementia Care in Nursing Homes, which established broad-based coalitions in 50 states and contributed to a 13.1 percent reduction in the rate of antipsychotic use nationally over 18 months. During her tenure at CMS, she also directed the development and implementation of a new Quality Assurance Performance Improvement (QAPI) program and led a national rollout for all nursing centers. 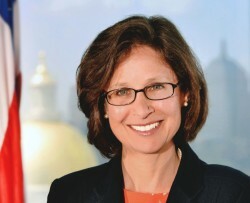 At the state level, she co-authored and implemented the Massachusetts Statewide Plan for Care Transitions used by the Secretary of Health and Human Services and state leaders as a roadmap for improving care transitions across settings. Dr. Alice Bonner, PhD, RN, FAAN, GNP, is the 2015 recipient of the Mary K. Ousley Champion of Quality Award for her contributions to quality in the long term and post-acute care community conferred by the American Health Care Association and National Center for Assisted Living (AHCA/NCAL). For conference details or to register please click here.